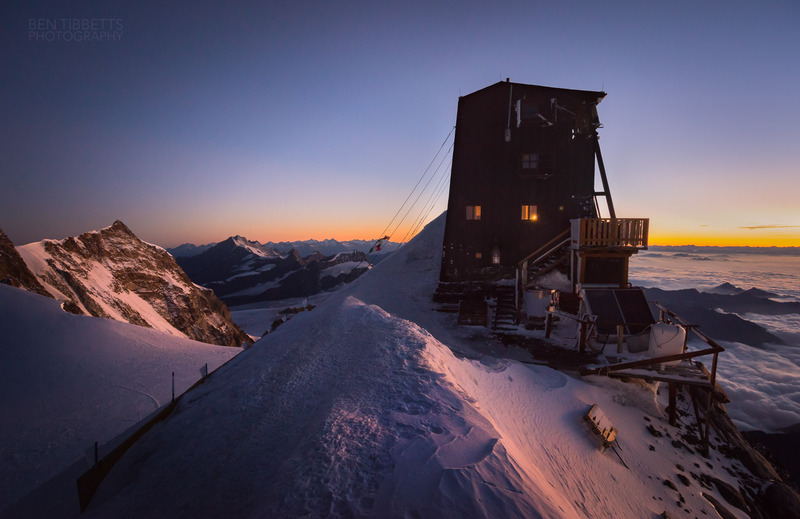 At 4554m, perched on the top of the peak ‘Signalkuppe’, this is the highest building in Europe, the Margherita Hut. It serves both as an alpine refuge for climbers and as a research laboratory for scientists studying altitude medicine among other things. We came up from the valley of Gressoney on the last lift and had planned to stay at the ‘Balmenhorn’ bivouac hut. However on arriving at sundown (via a short rocky ridge on ‘Vincent Pyramid’) there were already 25 people crammed in for 8 sleeping places despite it being midweek at the very end of the season. The wind was building but Phil (another British Mountain Guide) and I decided to press on to the Margherita hut to get a better night’s sleep. Phil had just guided the Matterhorn and Eiger back to back so was well acclimatised. I on the other hand had just spent 10 days cycling so started feeling pretty ropey on the last stretch to the hut! As we approached the easterly wind caught us on the Col and at 60+ kmph had me dancing about to stay upright. Phil is a bit of a unit so didn’t even notice… We arrived at 10pm to warm Italian hospitality, a late dinner and a good dose of dizzy hypoxia. As we left the refuge at dawn the next morning I took this shot as the colours were changing quickly over the eastern horizon. The wind was still blowing strongly but eased off through the day. 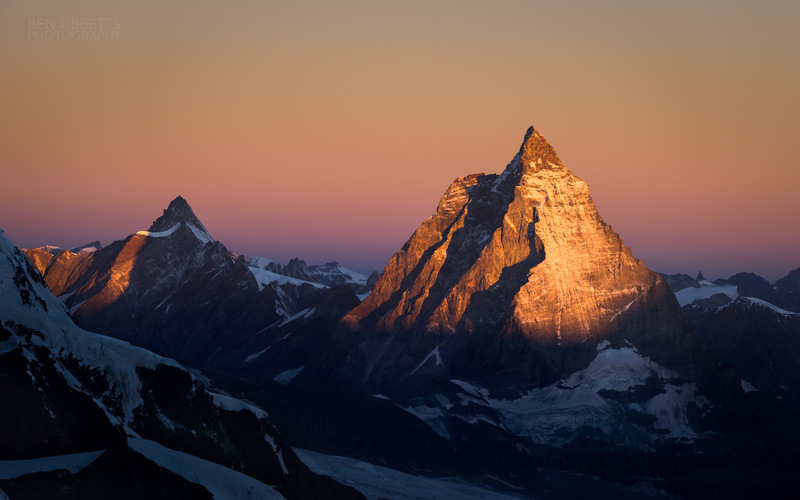 As we walked down to the base of the route the sun began to descend on the Matterhorn 20km to the west. Given the unusually clear air that day the colours were spectacular. We had a great time climbing the excellent ‘Cresta Rey’ route on the Dufourspitze (Monte Rosa), the second highest mountain in Western Europe and got back to Chamonix the same day.